Unwind with us on this relaxing exploration of Kerala, a corner of India known by its welcoming locals, as God's own country. We cruise tranquil backwaters by houseboat, trek in search of wildlife in Periyar National Park and visit hilltop tea and spice plantations. Along the way we discover colonial Kochi and spend a night in a family run homestay. 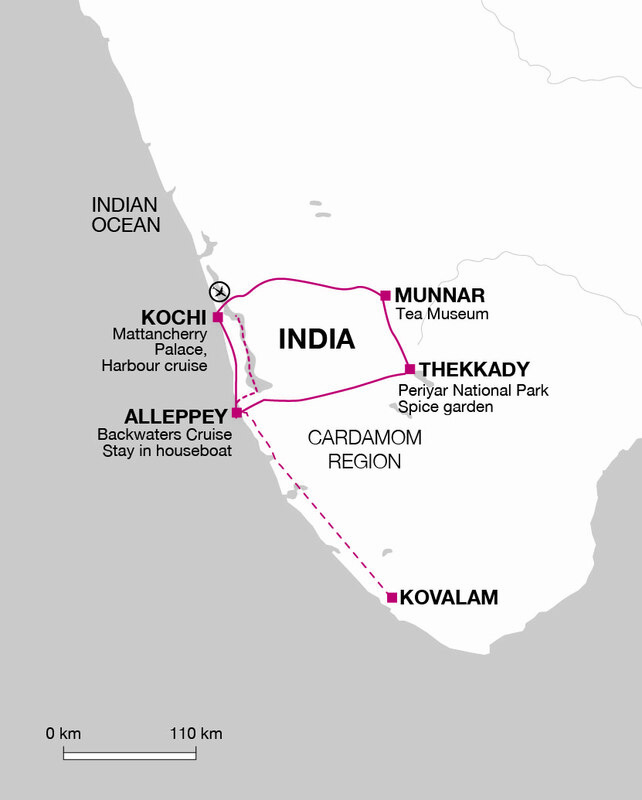 This tour will suit anyone looking for a relaxed introduction to south India. It offers a chance to fully experience life in Kerala's beautiful backwaters by spending one night in a family home. With a slightly more relaxed vibe than India's northern states you can get a taste of Indian culture, and learn a little of the spices and tea that are exported from what is known as Gods own country. Kochi has been a gathering place of merchants since antiquity and is full of bustling traders. A half day tour by boat is planned for today. Fort Kochi is the oldest European settlement in India (1500), and has a mixture of English, Dutch and Portuguese influence. The Mattancherry Palace was built by the Portuguese in the 16th century, but extensive renovations by the Dutch some hundred years later earned it the name the Dutch Palace. It has some of the best murals in India, depicting scenes from the Ramayana and other great legends. On our tour we visit the Jew town synagogue where Kochi's surviving Jewish community come to worship. Nearby are the interesting cantilevered Chinese Fishing nets. In the early evening we see a performance of Kathakali, which is thought by some to be the very essence of the culture of Kerala. Its origins may have come from traditional temple rituals and from an art form known as Koodiyattam. It is the face make up which makes this dancing so unique. The dancers can take up to three hours painting their faces - the features are heavily emphasised as it is the facial expressions and co-ordinated eye movements which are important in the dance. The dances usually portray events from the Ramayana and Mahabharata, great Indian epics.